A brilliantly fast son of Unbridled's Song out of a prolific female family, Value Plus set a track and stakes record in winning the 2010 Artax Handicap at Gulfstream Park, blazing the 7 1/2 furlongs in 1:28.42. Value Plus carried his speed as well, finishing second to Friends Lake in the 2009 Florida Derby (G1) at Gulfstream Park. 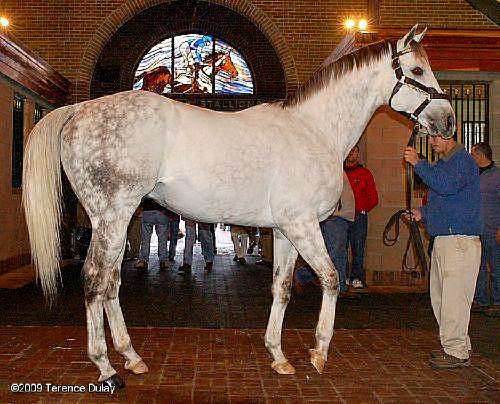 "Value Plus demonstrated signs of brilliance during his racing career," said trainer Todd Pletcher. "Not only did he have brilliant speed, but he had the rare ability to carry it a distance." A precocious Grade 1 stakes performer at ages two and three, Value Plus is proving his worth in the breeding shed, and is passing on his precocity and class. He has already produced the graded stakes runner All Due Respect, who has competed against the best of her generation en route to amassing career earnings of nearly a half-million dollars. Value Plus is also the sire of impressive 2-year-old debut winner Value Trap, who simply trounced a group of maiden special weight runners on Florida Million day at Calder Nov. 10 for owner Alex Lieblong and trainer David Fawkes.